Amsonia hubrichtii, the threadleaf bluestar, is one of my favorite plants. 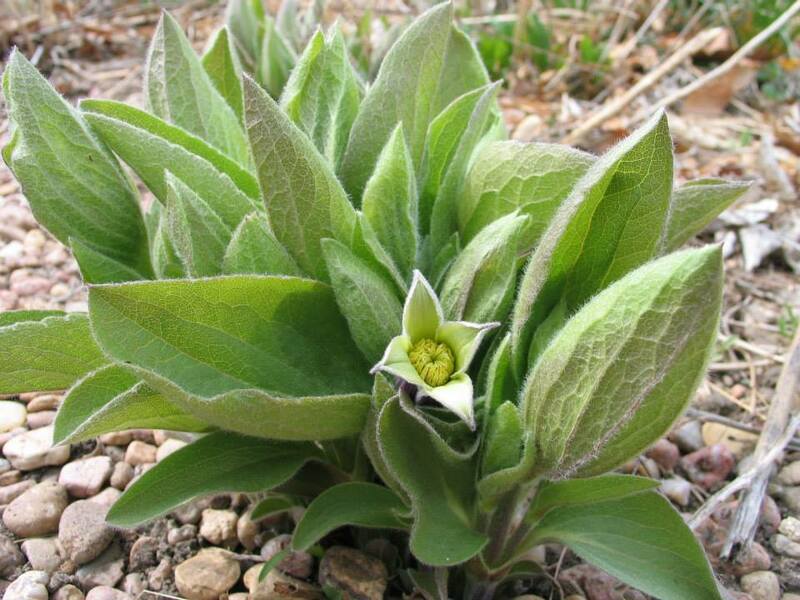 It was not well known among gardeners until the Perennial Plant Association named it the 2011 Plant of the Year. The species was discovered in 1942 by Leslie Hubricht growing in the Ouachita Mountains in central Arkansas. The species was later named in her honor. Each plant has ornamental qualities that make it stand out from other perennial wildflowers. In May and June, clusters of small powder blue, star-like flowers top the strong stems. The stems are encircled with soft, narrow leaves resembling pine needles, making each plant look like a small shrub with feathery texture and incredible fullness. I have found them to be extremely hardy, drought tolerant and very low maintenance. The real show develops in September when the foliage turns a butter yellow fading to a golden brown by October. One specimen plant is spectacular in each season of the year, but a group of ten or more massed together and strategically located are quite stunning. Individual plants can reach up to 48 inches tall and 24-36 inches wide. They prefer full sun to partial shade and an average garden soil. This summer I have only watered them 3 times, so they are tough. At the arboretum, they are planted along the east border paths. Amsonia hubrichtii is a dynamic perennial that deserves a place in your garden. Other Amsonia are just as ornamental, but offer different textural elements and sizes for just about any sunny to partial shade landscape setting. They are Amsonia illustris, Amsonia ‘Blue Ice’, Amsonia cilliata and Amsonia rigida. Find amsonia hubrichtii and other garden-worthy perennials on our Plant List 2015 and visit us at our FloraKansas Spring Plant Sale, April 24-27, 2015. Vines are underutilized in nearly every garden, in my opinion, including here at the arboretum. It may be that we don’t have the structures to support them and show off their attributes, or we are unfamiliar with how to grow them. Either way they need to be used more. In fact, I think vines are one of nature’s greatest gifts to gardeners. They can give us shade by covering a pergola, camouflage ugly elements within the garden such as sheds, poles and fences, or bring color, texture, and fragrance to a trellis or arbor. Vines are utilitarian because they fit into almost any available space. I need to use them more here at the arboretum, so I thought we could work through this problem together and maybe begin to incorporate these native vines to a greater extent, literally. Trumpet honeysuckle (Lonicera sempervirens ‘Major Wheeler’) is the best selection of honeysuckle I have grown. It has twining stems with smooth leaves that seem to be resistant to mildew. But who grows this plant for the foliage? I love the flowers. In late spring, it is covered in red trumpet shaped blooms that keep coming well into summer, especially with a post-bloom trim. The hummingbirds will find it from miles around. It grows best in a medium to moist well-drained soil and partial shade. Dutchman’s Pipe-vine (Aristolochia tomentosa) is a vigorous, climbing woody vine without tendrils. The interesting pipe shaped flowers appear in May and June. Large, heart-shaped leaves are attractive throughout the year and turn a nice yellow in the fall. In Kansas, it is found in the southeastern counties. I have this vine growing in morning sun and afternoon shade. It will need a trellis or arbor to grow on and a medium to moist soil. Pipevine is the host plant for the Pipevine Swallowtail butterfly. Grape Honeysuckle (Lonicera reticulata ‘Kintley’s Ghost) is a vine we have been using for several years. We have it growing on either side of the entrance to the Visitor Center. The gray-green leaves develop in an attractive eucalyptus pattern. At the terminal ends of the stems the bright yellow flowers develop in spring. It can grow in sun to partial shade and prefers an average to moist soil. It is great in form and flower. American Bittersweet (Celastrus scandens) is grown for the beautiful fruit clusters that develop during the summer and are noticed and eaten by birds in the fall. Male/female plants are separate and both are needed to produce fruit. Foliage is attractive on the twining stems. It grows best in a morning sun location, but can grow in full sun if given some supplemental water during the summer. Train along fence or over an arbor. Celastrus scandens ‘Autumn Revolution’ is a form with male and female flowers on the same plants. Passion Flower (Passiflora incarnata) develops three inch diameter lavender flowers that have a rich fragrance. These flowers are striking and have religious symbolism. The vines can reach up to 12’ in one year and die back to the ground during the winter. Situate in a semi-shade area with a medium to moist soil. I would mulch lightly to protect crown from harsh winter temperatures. Don’t miss the opportunity to include these great vines in your garden by visiting the arboretum spring plant sale. I tend to keep flowers at ground level but these vines will take your garden to new heights and add interest to levels not normally utilized. For more information on these vines and other garden worthy plants visit the arboretum website at www.dyckarboretum.org. The other day, I began transplanting seedlings of Fremont’s Clematis for our FloraKansas spring plant sale. I was thrilled that we actually will have some to offer this year. In the past, we have struggled to achieve germination, but this year we have been successful. The seed from which these plants germinated was collected last summer, as our staff took a detour on our way back from a retreat at the Flinthills Discovery Center in Manhattan. The seed germinated last fall and overwintered in the seedling flats. Over the past few weeks they have really come to life and it was time to move them before their taproot grew too large. Fremont’s Clematis, or Clematis fremontii, a rare prairie native from Kansas and Nebraska, is quite different from the traditional climbing clematis species. It forms a small bush that is covered in spring (late-April) with sugar-bell shaped flowers of purple and white. Each flowers curls at the end. The oval leaves are leather tough and covered with fine hairs, almost fuzzy in appearance. These plants, once established, are resilient. They develop into large clumps. We have had several plants in the same spot for over 15 years, in one of the xeriscape beds just outside the Visitor Center entrance. Fremont’s Clematis loves sun. We collected the seed from plants on a rocky hillside in central Kansas. They are thriving in that windswept exposed prairie. If they are thriving there, then all they need is plenty of sunlight (at least 6 hours) and a well-drained soil. I always look forward to their arrival in spring. They are one of the first plants to emerge and bloom in our rock garden here at the arboretum. If they are happy, they will give you years of consistent beauty. Be sure to come early to the FloraKansas Plant Sale and get some while they are available! Monarchs ingest toxic cardiac glycosides when their larvae eat milkweed leaves and advertise through their adult warning coloration: “look out for me…I’m poisonous!” The U.S. Fish and Wildlife Service may very soon be issuing its own warning on behalf of declining populations for this bright butterfly under the banner of the Endangered Species Act (ESA). A petition was submitted in August 2014 by The Center for Biological Diversity, Center for Food Safety, The Xerces Society, and Dr. Lincoln Brower to encourage listing of this species on the ‘threatened’ list. A ‘threatened species’ is one that is likely to become endangered in the foreseeable future throughout all or a significant portion of its range. 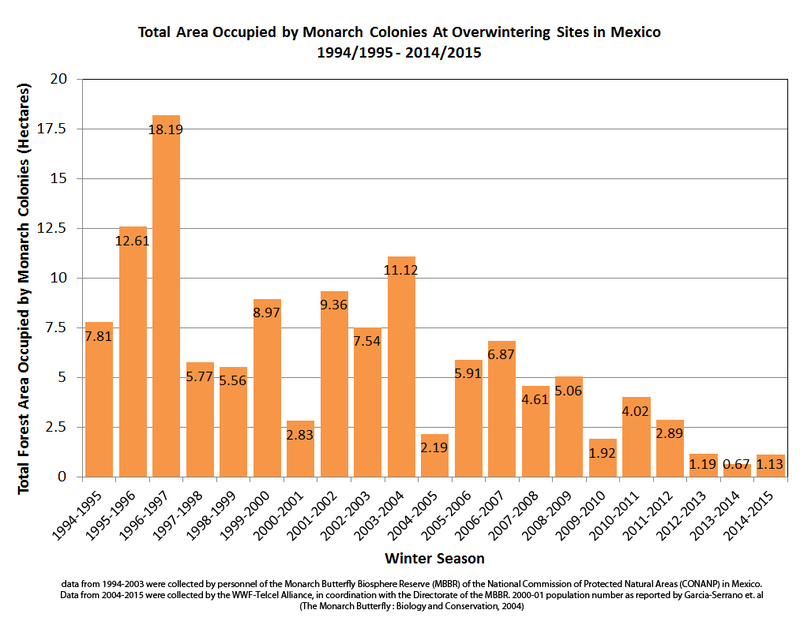 The following graph (Graph courtesy of the Monarch Joint Venture) shows over the last 20 years the area of monarch overwintering colonies in the forests of Central Mexico, which is their only overwintering location. Their population trend of precipitous decline is discouraging. 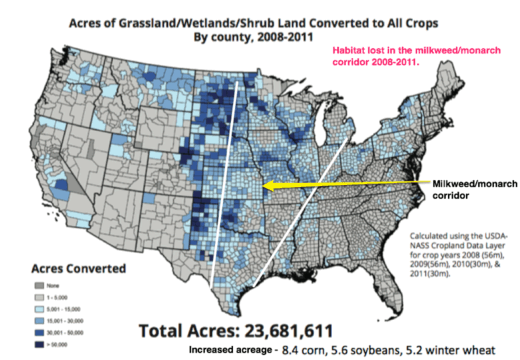 The part that is encouraging, however, is that we know exactly what the problem is – prairie habitat loss; specifically, the loss of milkweed (Asclepias spp. 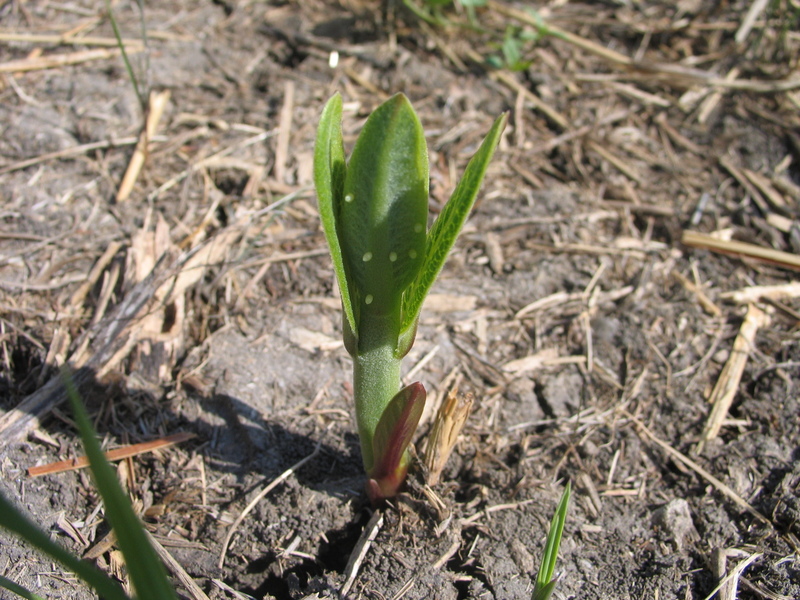 ), the monarch host plant. Americans do not like to be restricted or forced to spend money on anything and a threatened listing under the ESA will do just that. It is my hope that we can avoid listing of the monarch butterfly and restore its population, but this will require both education and action. The action part is what I will address here. If you live in the following monarch corridor, you must take action now. It can be fun, easy, and rewarding to establish milkweeds and I challenge everyone reading this post to take personal action in increasing milkweed populations in the coming growing season. There are two easy ways to do this: 1) establish milkweed plants in the areas you landscape, and 2) distribute milkweed seed in a nearby unmowed area. Plant Milkweed Plants – Landscaping with native plants is rewarding and South Central Kansans have eight commercially-available native milkweed species they can plant, including Asclepias incarnata (swamp milkweed), syriaca (common milkweed), A. tuberosa (butterfly milkweed), A. viridis (green antelopehorn), A. speciosa (showy milkweed), A. sullivantii (smooth milkweed), A. hirtella (prairie milkweed), and A. verticillata (whorled milkweed). These species can be purchased at the Dyck Arboretum of the Plains spring plant sale, Monarch Watch, and Prairie Moon Nursery. Plants establish and flower in the first year with proper care and provide beauty and insect nectar sources in addition to host plant larval food for the monarch. Distribute Milkweed Seed – Surely you know a grassland area along a nearby creek or waterway, in a park, or along a roadside that gets mowed or burned only periodically to keep it free of trees. 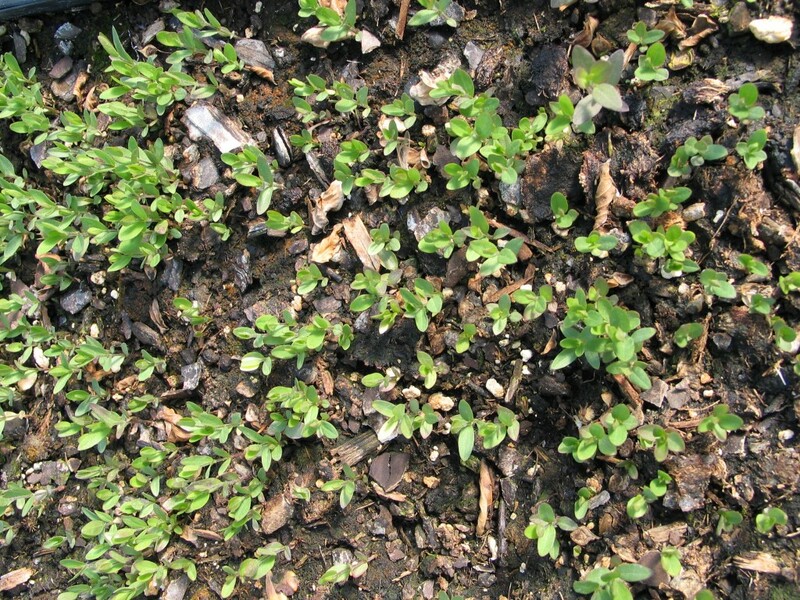 Collect some seed from a nearby prairie or even buy some seed of the species above from a native seed nursery (good sources include Prairie Moon Nursery and Missouri Wildflowers Nursery), get permission to plant, and distribute your milkweed seeds in the fall or early winter so that germination will happen and establishment will begin the following spring. 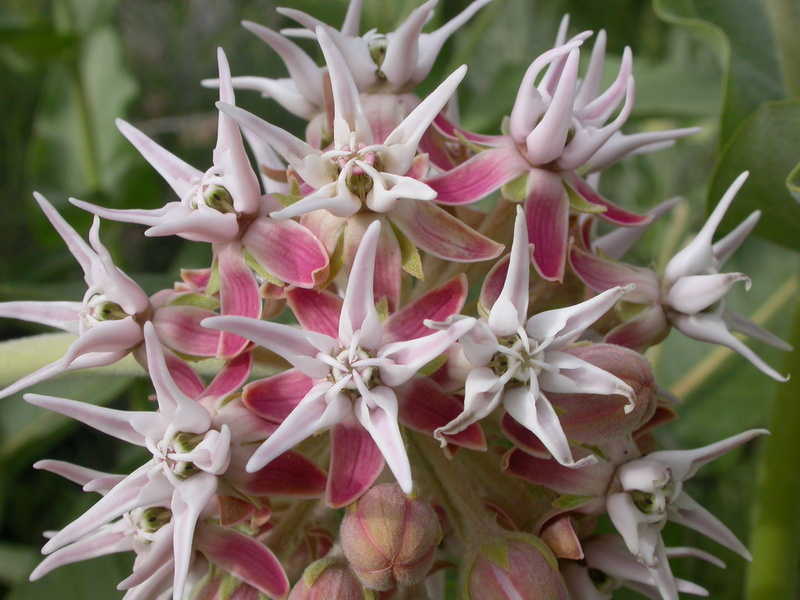 Common milkweed ( A. syriaca) is the species most preferred by the monarch and is easiest to acquire and establish. Distributing seed is a very cost effective and easy way to establish milkweed were it doesn’t currently exist. Do you remember the massive flocks of the passenger pigeon? Of course you don’t – Martha, the last known individual died in 1914. Your grandparents or great grandparents, however, may have been able to tell you first hand stories. 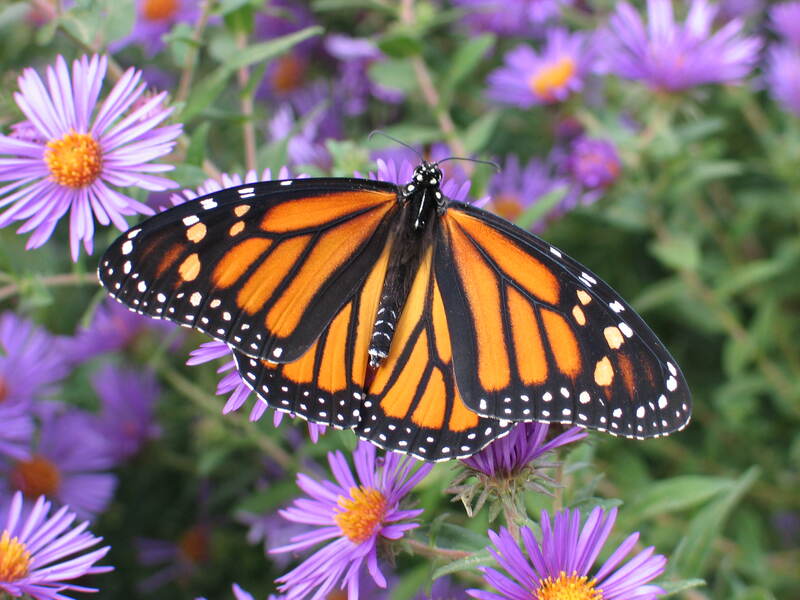 First hand experiences with monarchs may be something we currently take for granted. If we don’t act now, these encounters with monarchs may be something our grandkids or great grandkids never experience. Don’t let this happen.